Team NY's female squad heads to VA Beach headed by Ally Fitzgerald of Lynbrook. Fitzgerald has made her name known by winning Fargo and a runner-up finish at Super 32. Adding all-american honors this weekend will only grow her never ending list of accomplishments thus far in her career. Joining Fitzgerald in leading Team NY are the Macaluso sisters Sofia and Mia, as well as Copenhagen's Riley Dalrymple. Sofia and Riley will be competing at 120lbs. Mia Mac may be the most decorated female wrestler in the entire field with accolades that include 4x HS All-American, 2018 Folkstyle Cadet National Champion and 2018 Fargo Cadet National Champion. I for one won't be surprised seeing Mia on top of the podium this weekend. Grace Pauls enters at 136lbs. Pauls is a 2x Fargo all-american and know what it takes to reach the podium. Not to exlude other competitors this weekend, the entire New York squad is launching female wrestling and putting the Empire State on the map as a powerhouse nationwide. Click Here for the complete list of wrestlers. The Middle School division is a great opportunity to propel wrestlers as they enter high school in the coming years. New York sends many wrestlers with respectable credentials and resumes that can only get improve with a stellar performance. Matthew Marlow of East Northport is at 75lbs. Marlow was on the 2018 schoolboy national team. Jeffrey Ellert of New Hampton joins Marlow at 75lbs and has racked up quite the accolades as well. Joseph Manfredi of Herricks has already wrapped up one season of varsity finishing 4th at 99lbs in Section 8 (Nassau County). Manfredi, who is only a 7th grader, has a bright future ahead of him. 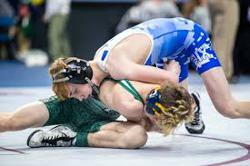 Attica-Batavia's Casper Stewart (100lbs) also wrapped up his initial varsity season concluding with an at-large berth into the NYS tournament. Click Here for the complete list of Middle School wrestlers by weight. In total, 78 freshman competitors will represent New York State. Leading the freshman class is 2019 NYS Runner-Up Killian Foy of MacArthur, 2019 NYS bronze medalist Anthony Conetta of Massapequa and 2x NYS place finisher Carter Baer of Gouverneur. Both Foy and Conetta are in the deepest weight of the tournament. The 106lb class has an estimated 160 competitors vying for a top 8 place finish and all-american honors. Foy and Conetta are no strangers to one another. Conetta defeated Foy in the Nassau County finals and Foy upending Conetta in the NYS semi-finals. Click Here for the complete list of freshman by weight. Onto the sophomores and Team NY does not disappoint. Three New York State champions lead the class of 2021. Jace Schafer of Palmyra Macedon and Jordan Titus of Center Moriches both claimed NYS titles in 2019 while Central Valley's Marek Bush was a gold medalist in 2018. From top to bottom, Team NY has 13 other NYS place finishers heading to VA beach. Both Chase Liardi of Massapequa and Jake Null of Dolgeville are silver medalists and know what it takes to make the finals of a big tournament. With 122 wrestlers in total, the New York sophomores should be in line to contend for a team title. Click Here for the complete list of sophomores by weight. The Empire State's junior class is quite impressive and like the sophomores should flirt with the opportunity of a team title. To put the depth of Team NY into perspective, 12 of the 14 weights will include at least 1 NYS place finisher. There are 5 weights that has 4 NYS place finishers, 113, 120, 152, 160 and 195. Four New York State champions are in the field. Two time champion Dante Geislinger of Norwich is part of that elite 113lb class. Joining Geislinger is 3x NYS place finsher Josiah Encarnacion of Wantagh, 2019 NYS Runner-Up Micah Roes of Lowville and 2x bronze medalist Luke Smith of Hauppauge. Eastport South Manor's Zach Redding, who was a NYS champion in 2018 is in the 132lb weight class. Two NYS Champions, Willie McDougald of Niagara Falls and Brady Worthing of Tioga, will both be at 138lbs. McDougald was a champion in division 1 while Worthing was a champion in division 2. Many NY fans would love to see these two meet up. Out of the 33 NYS place finishers, 7 of them have placed in the state 3 times, Wantagh's Josiah Encarnacion and Matt Rogers, Port Chester's Ivan Garcia, Eastport South Manor's Zachary Redding, Alrington's Dennis Robin, Niagara Falls' Willie McDougald and Niagara Wheatfield's Justin McDougald. Click Here for the complete list of juniors by weight. Potentially one of the final tournaments that seniors may wrestle in will take place this weekend in Virginia Beach. To go out on top as an NHSCA senior national champion is a perfect ending to stellar careers. With only 82 wrestlers competing, the Empire State still packs a lot of punch. Two NYS champions, Jimmy Ryan of Monsignor Farrell and Chandler Merwin of Walton, enter at 126lbs as well as 2019 NYS Runner-Up Tyler Kellison of JD/CBA and Christian Gannone of Eastport South Manor and Chris Cook of John Jay Cross River. New York has 12 representatives at 145lbs, led by 2019 NYS Champion John Worthing of Tioga. Four other NYS place finishers join Worthing in one of the biggest brackets of the tournament, Ryan Burgbacher of Patchogue-Medford, Ray Costa of Cold Spring Harbor, Kris Ketchum of Rocky Point and Chase Runfola of Letchworth. Others NYS Champions that will be competing are Zach Lawrence of Duanesburg (152lbs), 2x champion Hunter Shaut of Central Valley (160lbs) and UPenn recruit Joey Slackman of Commack (285lbs). Other multi-NYS place finishers who have a great shot at all-american status are Caleb Robinson of Walton (120lbs), Devin Woodworth of Horseheads (138lbs), Austin Lamb of Tioga (152lbs), Warren McDougald of Niagara Wheatfield (152lbs) and Corey Connolly of Rocky Point (160lbs). Click Here for the complete list of seniors by weight.